Holds up to 36 long guns & 6 handguns. Deluxe door organizer standard for more storage options. Plush adjustable shelving and interior walls. Factory installed USB equipped electrical outlet. Predrilled through the steel for a dehumidifier (3/8″ opening, dehumidifier not included). 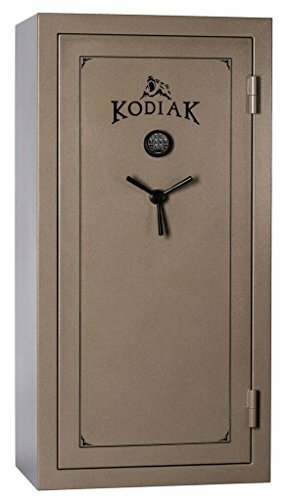 This rock solid safe features heavy bodied construction, fine styling and adjustable interior, and the industry’s best residential warranty and customer service. Limited Lifetime Warranty Fire Protection: A full 60 minutes of protection at 1400°F Advanced protection with 3 layers of 12mm fireboard in the ceiling, 2 layers on the walls, floor, and door Heat activated door seal expands up to 7 times its size which seals the door edge to help keep out heat and smoke Security Features: Thick 2.75 mm steel composite door and body Three hardened steel plates protects the lock from drill attacks Patented F-15 Locking system featuring an internal Anti-Tamper clutch Spring loaded re-locker keeps safe secure if lock is tampered with or removed Large door bolts (1.5″ diameter), 4-sided protection (14 door bolts total) Certified with UL ® as a Residential Security Container and meets or exceeds California DOJ acceptable gun safe standards UL Listed commercial-grade Type 1 electronic lock Style and Function: Holds up to 36 long guns & 6 handguns External dimensions: 71″H x 36″W x 24″D (not including handle) 750 lbs Deluxe door organizer standard for more storage options Plush adjustable shelving and interior walls 3-spoke vault style handle Factory installed USB equipped electrical outlet Predrilled through the steel for a dehumidifier (3/8″ opening, dehumidifier not included).